Putting together your estate plan is not as daunting as it might first seem, and it pays big dividends in the long run. Do you really want a judge deciding who will be the guardian of your children, or the State of Oklahoma dictating who will receive your property after your death? Chances are you already have ideas about who you would like to raise your children if you can’t do it and who would handle their inheritance, or simply who should inherit your property. But your choices may not be what happens, unless you make them known with a properly prepared estate plan. Not having an estate plan in place can cost you not only dollars and cents, but also in unnecessary family discord. 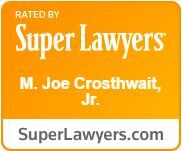 Contact the experienced attorneys at The Crosthwait Law Firm to discuss your personal estate planning needs and wants today.